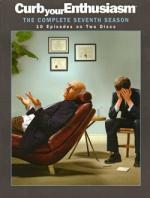 Larry David leads a troubled life — he's got a high-maintenance girlfriend he'd like to dump, an ex-wife he'd love to win back, fed up friends, and offended celebrities wishing him physical harm. So how can he turn it all around? See Larry woo a paraplegic, offend a midriff-baring assistant, bludgeon a pet swan, and let loose on nine-year-olds, all while planning the much anticipated Seinfeld reunion. Will reviving his former show bring Larry's old life back as well...or only invite more problems? The closest we will ever get to a Seinfeld reunion. Larry David (who was the co-creator and executive producer on Seinfeld) is organizing a Seinfeld reunion show. This season was the most fun since season four where Larry David was cast by Mel Brooks in a "The Producers" stage production. We get all four Seinfeld cast members back and even Wayne Knight (Newman) and Estelle Harris (George's mother) appear. And they have rebuild two sets of the Seinfeld series. Jerry's apartment and the diner. When they are playing the Seinfeld characters on these sets, it is hard to believe that already ten years have past since the Seinfeld finale. Seeing these scenes you can very well image them doing another full season without big differences to the old series. From the revolutionary minds of Pixar Animation Studios and the acclaimed director of Monsters, Inc. comes a hilariously uplifting adventure where the sky is no longer the limit. Carl Fredricksen, a retired balloon salesman, is part rascal, part dreamer who is ready for his last chance at high-flying excitement. Tying thousands of balloons to his house, Carl sets off to the lost world of his childhood dreams. Unbeknownst to Carl, Russell, an overeager 8-year-old Wilderness Explorer who has never ventured beyond his backyard, is in the wrong place at the wrong time - Carl's front porch! The world's most unlikely duo reach new heights and meet fantastic friends like Dug, a dog with a special collar that allows him to speak, and Kevin, a rare 13-foot-tall flightless bird. Stuck together in the wilds of the jungle, Carl realises that somtimes life's biggest adventures aren't the ones you set out looking for. 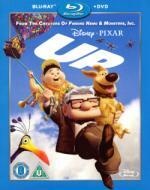 Up reaches new heights with a pristine picture, theatre-quality sound and hours of never-before-seen bonus features available only on Blu-ray™ Hi-Def. It's an adventure that will send your spirits soaring! I really like the first half of this movie. Great introductions of the characters. But as with the first time I have watched it in the cinema, I felt it lost something from the moment "Kevin" appears. And then shortly after with all the talking dogs. It's a little too ridiculous even for a movie where a house flies with balloons. But still the second half is worth watching. Some great action scenes, which were even better in 3D. I think it could have stood being more ridiculous! A lot of people seem to dismiss it as a film of two halves, yet I don't. It's kind of a metaphor for his state of mind. You can also see it as a kind of Alice in Wonderland setup too. By the way, I found this earlier on Facebook. Someone has made a music track just using sounds from Up. It gets annoying, but it is clever. Also, rather spoiler-ific if you watch it closely, so beware, newbies! Another family adventure from the hit-making director of 'Spy Kids', "The Adventures of Sharkboy and Lavagirl" is nonstop fun and stars Hollywood favorites David Arquette, Kristin Davis and George Lopez. Everyone always knew that Max had a 'wild' imagination...but no one believed that his wildest creations - a boy raised by watchful great white sharks and a girl with the force of a volcano - were real! Now, these two pint-sized action masters will show Max that even an ordinary kid has what it takes to be extraordinary! Even the smallest dreamers can become the biggest heroes in this entertaining motion picture! A very silly movie. In huge part a total rip-off of "Neverending Story". But it is fun, for what it is. 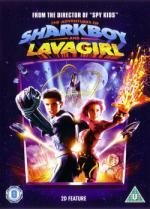 Sharkboy is totally ridiculous, but Lavagirl is an interesting character. Her search for her true nature makes for good character moments (as good as it gets in a film like this). The special effects are below average for the most part, though there are some exceptions. Buckle up and prepare for a ride that's out of this world! When Earth is threatened with imminent destruction, an out-of-shape, out-of-work and over-the-hill former superhero is called back into action to save the day. That hero is Jack Sheppard a.k.a "Captain Zoom" (Tim Allen). The problem is he's lost all his powers. And now, it's up to General Larraby (Rip Torn) and Dr. Grant (Chevy Chase) to coax him into taking one more mission: train a ragtag bunch of kids with amazing superpowers of their own. With help from the brainy Marsha Holloway (Courteney Cox), they'll learn to work as a team and harness their powers to battle an evil menace who's determined to make one seriously huge mess of life as we know it. I cannot believe that this movie has such a bad rep. I really enjoyed it. It was much more fun than expected. Little Cindy is a riot. Also the rest of the cast is fun to watch. And why was Tim Allen nominated for worst actor? He was perfect for the role of a washed-up superhero. Reminded me a little of his role in Galaxy Quest. I have The Adventures of Sharkboy and Lavagirl in my 'pile' IIRC. Good reviews, thanks. I have The Adventures of Sharkboy and Lavagirl in my 'pile' IIRC. Don't expect much from this one. After watching Zoom now, I have to say that Sharkboy and Lavagirl is very much below that. I would say that Sharkboy and Lavagirl is for kids, whereas Zoom is for the whole family. Fun but nothing new and I would consider buying really really cheap used. The triple movie pack I got goes for £1.39 new at Amazon.co.uk marketplace. I think it was money well spent. Zoom alone was worth it. I don't recall Matt LeBlanc or David Schwimmer doing anything lately (I think Schwimmer is doing more directing than acting now). The last thing I remember David Schwimmer seeing in is in Curb Your Enthusiasm: Season 4. He is playing himself and in the storyline he is cast together with Larry David in Mel Brooks' The Producer stage production. Even so, I already own Thunderbirds aswell, so as far as buying a triple pack for it I'll pass. I did order it right this minute from CeX though for £1.00 delivered (used), along with the 1935 movie The Informer which I had in my basket most the day with nothing else to pair it with to reach the £2 free shipping limit. I completely forgot Kate Mara was in it. I really liked Zoom when I saw it too. Yes it is a bit silly at times...but the silliness works for the movie and helps to make it more entertaining. Was't Schwimmer in a film with Simon Pegg. Run Fatboy Run, maybe? He was the director of that film. Saving is a full-time job for ex-astronaut Jeff Tracy, his four eider sons and their five incredible machines: the Thunderbirds. Together they form International Rescue, a top secret organisation the world relies upon. But today, they are under threat: their arch enemy The Hood has trapped them in space and taken over their hi-tech crafts and technology for his own evil purposes. Unbeknown to The Hood though, Alan the youngest Tracy boy, is still on their secret island. But does he have what it takes to save his family... and the world? Directed by Jonathan Frakes (Star Trek Insurrection; Star Trek: First Contact) and starring Ben Kingsley (Schindler's List, Gandhi), Bill Paxton (Apollo 13, Twister) and Anthony Edwards (E.R. ), Thunderbirds blasts into action with extraordinary vehicles and brave young heroes. As a kid I sometimes watched the original series when I happen to catch it on TV, but I never really followed it. This movie, though having good effects and good production values, is nothing remarkable. The problem with it is, that it seems solely targeted at kids, and not to the now adult fans of the original series. The looks of Lady Penelope very much reminded me of Sarah from Chuck. Although she is played by Sophia Miles who I know from Outlander.